Do you sometimes struggle to live on your own? Do you sometimes feel lonely at home? If you have a spare room, and you don’t mind sharing your home, Homeshare could be perfect for you. Homeshare matches people who need who need companionship and practical support (householder) with people who need accommodation (homesharer). it’s a mutual arrangement that allows you to give back to your community. 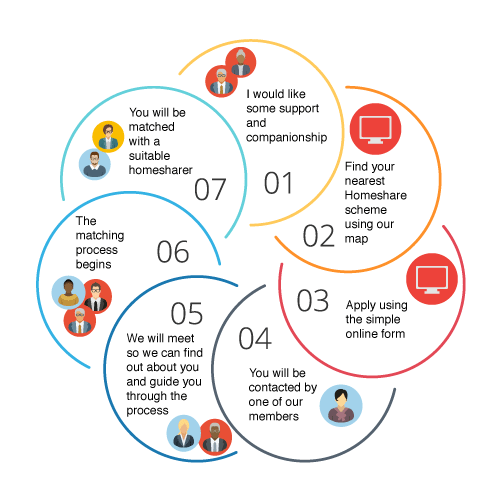 A Homeshare organisation will carefully match you with a suitable homesharer based on your needs. It can take a few weeks to find the perfect homesharer for you. This is because the Homeshare organisation will conduct thorough background checks to find a caring, helpful and compatible homesharer to live in your home. You’ll get to interview the homesharer to see if you are compatible. If you’re both happy with the match, together you’ll agree what support (at least 10 hours a week) the homesharer will give you. This agreement is flexible and can include a variety of tasks like shopping, gardening, cleaning or accompanying visits to the doctor. You may have to pay a monthly administration fee to the Homeshare organisation to cover the cost of the service. The average cost is £140 per month. If you think Homeshare is right for you, you can check if there is a scheme in your area by going to our Find a Homeshare scheme map. Or you can call our Homeshare team on 0151 227 3499.